A few years ago, two prescriptions from the estate of London chemist H.A. Rowe went up for auction. One was for Rudolf Hess, who was held at the Tower of London in May 1941 and the other was for Josef Jakobs, who was executed at the Tower in August 1941. The Tower of London was the successful bidder for the prescriptions and Bridget Clifford from the Royal Armouries kindly shared a copy of the documents with me. Originally, I was writing this post to touch, very briefly, on the identity of Lt. R.W. Taylor, the military doctor stationed at the Tower of London who signed both prescriptions. His identity however, is a bit of a mystery due in part to the lack of forenames and his rather common surname. On 21 October 1940, one R.W. Taylor M.B. (Medicinae Baccalaureus) received an Emergency Commission as a Lieutenant, but beyond that, there is very little information on our Tower doctor. Without any first names, trying to pin down the identity of the doctor is a bit challenging. There was a Ronald Wentworth Taylor who went on to become an obstetrician in the 1950s and 1960s, but whether this man is identical with our Lieutenant is up for grabs. On the other hand, I did notice something interesting with the two prescriptions. First up, the prescription for Rudolf Hess. You can see that R.W. 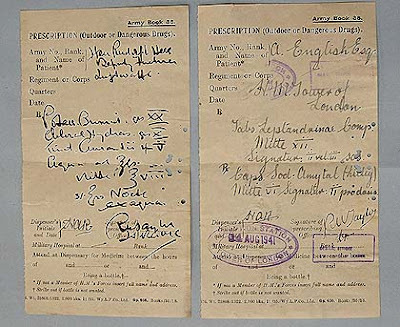 Taylor (Lt. RAMC) has signed the prescription and that the pen he used seems to be identical with the actual prescription. The ink is quite dark and you can see that the initials of the chemist, H.A. Rowe, are made using a different pen. If we take a look at Josef Jakobs' prescription, we see something different. The pen that was used for Josef's prescription seems to be the same as the one used by H.A. Rowe. It is of a similar tone and width. The signature of R.W. Taylor is slightly darker and the line appears sharper, not as soft as the H.A.R. pen. In addition, if you compare the "H" of the chemist's initials, you can see that it is virtually identical with the "H" in "H.M. Tower of London". 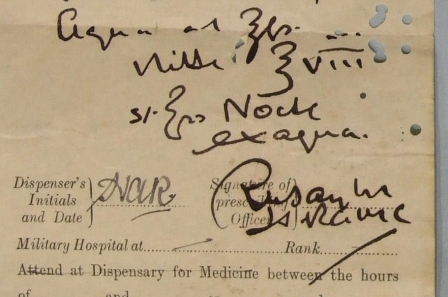 The handwriting on Josef's prescription is very different from the Hess prescription. It is much neater and of a very different style. If we agree that Hess's prescription was written by R.W. 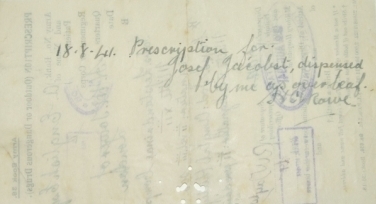 Taylor then we are left to conclude that Josef's prescription was written by H.A. Rowe, not by Lt. R.W. Taylor, which is very curious. Perhaps our Lt. R.W. Taylor simply sent a blank signed prescription to the chemist with a note asking for something to calm the nerves and the stomach, trusting that the chemist would prescribe what was required. This might explain why the prescription is made out to "A English Esquire". Rowe had no idea for whom the prescription was required. A few days later, however, after Josef's execution, Rowe put two and two together and made a note on the back of Josef's prescription. 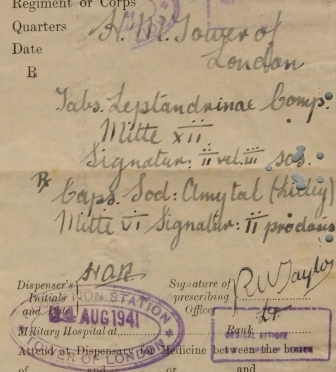 18.8.41 Prescription for Josef Jacobst [sic], dispensed by me as over leaf. H.A.Rowe. Did you ever find out anything about the pharmacist H.A. Rowe? Thanks for the question. I have scratched a little bit at H.A. Rowe but not with any serious intention. Just trying to see how traceable he would be and not finding a lot at the first go. Other than the auction that sold off the prescriptions for Josef and Hess.